Since I have my blog reader search virtually every major newspaper in the U.S. for news stories on diabetes, I can tell you that most stories are from the major newswires (Associated Press, Reuters) and get published in multiple papers. Too often, the coverage is uninformative, uninspiring, underwhelming, and frankly, full of the same one-sided coverage (often omitting key facts) we see in the press all the time. The fact is that diabetes may be making the news, yet relatively few reporters seem to do their homework on the subject, or else their editors cut out important facts, leaving banalities in the articles that actually go to press. Recently, the Pittsburgh Post-Gazette has run a series of articles on "The Out of Control Diabetes Crisis". So far, I have found the coverage to be just more of the same, but this morning's edition was different. Its no secret that diabetes is a growing health problem, not only in the U.S., but worldwide. Much of the burden for managing this disease falls on the patient, and diabetes education is a vital element in this equation. Yet in spite of the importance of their job, the evidence strongly suggests that the medical profession, including many endocrinologists and diabetes educators, are failing abysmally at their assignment. The rate and incidence of blindness, amputation, heart attacks, and kidney failure caused by diabetes — as reported by the NIH — continues to rise year after year. Insurance companies and health care providers ponder this failure and, with few exceptions, conclude that "educating people with diabetes" to adhere to an intensive regimen of injections and diets will miraculously solve the problem. Yet education and instruction is often littered with platitudes about future complications for failure to manage the condition as prescribed. Sometimes, education is done in larger facilities (such as at senior centers) so that a whole group of patients can be instructed at the same time. 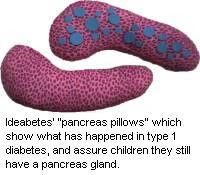 But relatively little has been done to ponder why diabetes education has failed. If you think about typical diabetes education today from the perspective of patients, children are often terrified of instruction on how to pierce themselves with needles and lancet devices, and while adults may be slightly more rational, many adults with diabetes claim they feel fine, so the message often fails to get through. Several years ago, a diabetes educator from the Pittsburgh area named Mary Jo Dudley, (she now lives in Dover, NH) set out to make diabetes understandable. Mrs. Dudley started a sideline business called Ideabetes in 1989 to create tools to help people understand the disease. A key element in her instruction is the use of various props, including glucose wands, pancreas pillows, insulin spheres and blood sugar bingo cards which are used to demonstrate her points. Her diabetes instruction goes well beyond the boring textbook lessons and actually teaches many diabetes patients a thing or two. Even more importantly, she is able to impart the lesson that diabetes is serious and needs to be managed. For example, Mrs. Dudley's glucose wands, are clear plastic tubes full of liquid and sequins. But one tube is watery, reflecting normal blood sugar, while the other is syrupy, representing blood with high levels of glucose or sugar. As her wands suggest, when the blood is syrupy with sugar, the heart has more problems pumping it, especially into capillaries in the eyes, legs or kidneys, as proven by the lethargic sequins. "Glucose attaches to the red blood cells and makes them tacky," Mrs. Dudley said. "Picture in your mind cells swimming in Karo syrup." Whether they realize it or not, "Most nurses are teachers," Mary Jo Dudley said, realizing early in her career that people need more than cold, hard facts to understand diabetes. So when patients ask why they must keep their blood sugar under control or take aspirin, the answer is simple: it thins the blood and prevents clot formation. The lesson for today is that teachers are really the key to diabetes education, and that diabetes education and educators are teachers first, nurses second. The job of teaching diabetes control is huge, and once the job is looked at as a teaching role, then there are lots of different ways to approach the issue, the key is to understand patients and develop a way to reach them. Lots of great teachers can indeed change the the world, and many do one student at a time. Perhaps a glucose wand or an insulin sphere might just be the missing element needed to help educators make diabetes education actually work! Thanks for the article. It's nice to know there are committed educators who understand current teaching/training is failing miserably as evidenced by the NIH statistics. Kudoes to Mrs. Dudley. I think that is fantastic! Thanks for bringing it to our attention. Education is undoubtedly important, and better training for nurses, CDEs, and endocrinologist is certainly a worthwhile effort. But I think there's a more difficult issue to grapple with here. It's about how individuals (and society as a whole) value(s) their health -- and here's the tricky part -- not just now but in the future. In the constant battle between the instant gratification of an ice cream sundae vs. better eye sight, better kidney function, and lower risks of morbidity and mortality 10 years from now, the ice cream will win 99/100. The slow and insidious damage diabetes causes rarely produces sufficient deterrence until it is much too late. I don't know what the answer is, but I think people have much too high a discount rate on their future health in their lifetime utility function. Furthermore, there's often a significant gap between theory and practice. One might know what (s)he is supposed to do, but turning that knowledge into habit is another significant crux in having a nation of healthy diabetics. Diabetes is a growing health problem in all over the world.The main reason behind it is the unawareness of people towards the food that must be consumed. Sue, with all due respect, I don't agree. The primary reason type 2 diabetes is growing is the increased prevalence of processed foods with little nutritional value taking the place of traditional diets which consisted mainly of whole foods.